The JNU row took an ugly turn on Monday, when at least ten journalists and several students were assaulted by lawyers and a Delhi BJP MLA inside and outside the Patiala House Courts, where the sedition case against JNU Student Union President Kanhaiya Kumar was to be heard. The Police personnel present at the scene allegedly remained mute spectators. Bar Council of India has taken a serious note of the incident and has decided to conduct an inquiry headed by a former High Court Judge. 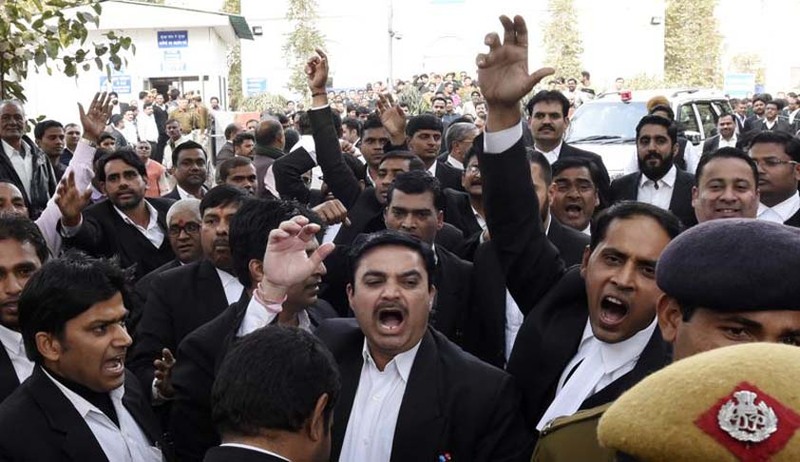 A mob of around 50 lawyers began the scuffle with shouting anti-JNU slogans and demanding that the University faculty present inside the Court leave. “You (JNU) produce anti-nationals and terrorists. You should get out of the country. Long live India, shut down JNU,” they shouted. They then launched an attack at the teachers and students, calling JNU a “den of anti-India elements and terrorists”. The mob began accusing media persons of being JNU supporters after they refused to tender their identity cards to the group. While spectators were punched and slapped inside the courtroom, another group of self-proclaimed “patriots” assaults students and journalists outside. The lawyers also tried snatching and scanning cell phones of journalists, witnesses and victims, in order to prevent them from recording the incident. A day before the assault, a few members of the Patiala House court bar association reportedly received a WhatsApp message requesting them to be present at the court on Monday morning for “peacefully” teaching “anti-nationals a lesson as per law”. “All of you are welcome at the Patiala House court on Monday morning. Peacefully, we will teach these anti-nationals a lesson as per the law. The conspiracy of breaking the unity of the country that they have hatched at the Ganga dhaba, we will demolish that at the Patiala House court, and we will show what it takes to be a patriot,” the message read. Adding to the havoc, Mr. O.P. Sharma, BJP MLA from Vishwas Nagar, along with his supporters thrashed CPI minority cell leader Ameeque Jamei and assaulted him outside the court complex. “Mein goli bhi maar deta agar bandook hoti. Koi hamari Ma ko gaali dega to kya usey maaroge nahin (I would have opened fire if I had a gun. If someone abuses our mother, won’t I beat him up),” he was quoted as saying after the incident. He was present in the Court premises in connection with another case involving Union Finance Minister Arun Jaitley. Complaints of physical assault have been registered at Tilak Marg Police Station by nine journalists. They are, Kaunain Sheriff M. and Alok Singh, The Indian Express; Amit Pandey, IBN 7; Akshay Deshmane, Economic Times; Amey Tirodkar, Maharashtra One; Sana Shakeel, The Times of India; Shree Nirash, Sahara Samay; Amiya Kushwaha, IANS; and, Azaan Javid, DNA. Manu Shankar of Kairali News had been taken to hospital after the attack. FIRs have been registered under Section 160 (affray) and Section 427 (causing damage to property) of the Indian Penal Code. “More than half a dozen journalists, including women were man handled and physically assaulted by lawyers in the presence of security personnel deployed in the Patiala House Courts,” the complaint reads. Kanhaiya Kumar has been charged with sedition and criminal conspiracy over his comments on the hanging of Parliament attack convict Afzal Guru. On 11 February, BJP MP Maheish Girri and Akhil Bharatiya Vidyarthi Parishad (ABVP), the BJP’s student wing, had filed a complaint against unknown persons under Section of 124 A (sedition) and 120B (criminal conspiracy) of the Indian Penal Code. On Monday, he was to be produced before Metropolitan Magistrate Lovleen for remand proceedings. However, sensing more trouble, Kanhaiya was produced before the Magistrate at the Vasant Kunj Police Station, where his police custody was extended for two more days, after in-camera proceedings. The altercation within the Court premises was followed by a strike by JNU students, demanding the leader’s immediate release. The JNU Teachers Association has also decided to join the strike. “The JNU teachers association in an emergent meeting held today decided to join the students' strike from tomorrow. The administration needs to answer how it plans to mend the damage done due to mishandling of the issue by it,” JNUTA president Ajay Patnaik said. Another petition has been filed before the Delhi High Court by Ranjana Agnihotri, seeking a National Investigation Agency probe into the sedition case against the JNU Student Union President. The plea, which was mentioned before a Bench comprising Justice B.D. Ahmed and Justice R.K. Gauba, also sought a judicial inquiry in the case. The petition has been listed for Tuesday. In a related development, a complaint has been filed by the Communist party of India (Marxist), alleging that phone calls were received at its office late on Sunday threatening to harm General Secretary Sitaram Yechury for his support to the protesting students.